The LVM Nature Park in Tērvete in year 2019 plans to hold more than 30 events – thematic celebration days, creative environmental workshops, forest environment education lessons and seasonal hikes. Last year Nature Park in Tērvete hosted the popular and joyful trail run “Stirnu buks” for the first time. Looking at the planned events of 2019, before the active tourist season – on April 27 – Tērvete will host second competition of the new season of the trail run “Stirnu buks”! Test you strength by getting to know and enjoying the valley and the steep shores of Tērvete river, the magic of Tērvete mound and the vastness of ravines, and of course, the stair sections and hillocks characteristic to Nature Park in Tērvete. More information – stirnubuks.lv. 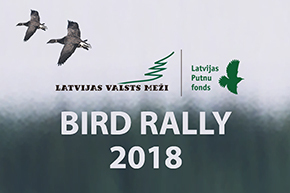 In year 2019 the largest forest informative event in the Baltic, the “Forest Days of Latvia” will take place on the 24 and 25 of May at the LVM Nature Park in Tērvete. It will gather more than 100 different organisations connected with forestry, woodworking and environment. Families and all interested are welcome to attend the event on Saturday, May 25, to get to know forestry sector of Latvia, relax and spend a quality time in nature. Event will have free entry. Several events that have become a tradition also will not be left out. They have made it also to this year's Event Calendar of Nature Park in Tērvete – the Walpurgis Night event or “Twilight hours for families” as usual will be held on April 30, the “Waking of the Fairytale” will be celebrated on May 11, the “Forest Harvest Festival” on September 21, however, we will wish sweet dreams and celebrate the “Lulling of the Fairytale” on October 12. The season of creative environmental workshops at the Dwarfs’ Cottage with the kind Dwarf family at the Nature Park in Tērvete, as usual, will be interesting and active. In March together with visitors of the park we will make birdhouses, however, Easter will be pre-celebrated in the creative workshops together with pre-school and 1st and 2nd grade children. But in November and December we will celebrate Mārtiņdiena, will celebrate the birthday of Latvia and will open the gates of winter, when waiting for the Christmas together with the pre-school and 1st and 2nd grade children. LVM Nature Park in Tērvete offers a marvellous recreation for all generations. See you in the rich, surprising fairytale forest at the LVM Nature Park in Tērvete!